On Tuesday, I said that nobody ever denounces the New York Times's genetics reporter Nicholas Wade for burying all the current shibboleths about race under a constant stream of articles on new genetic findings — they just don't even grasp what he's done. But, I should have realized there was at least one purveyor of the conventional wisdom smart enough and irate enough to have a clue: U. of North Carolina anthropologist Jonathan Marks. Marks, for example, was just about the only person on the left to understand that the cover of L.L. Cavalli-Sforza's 1994 magnum opus The History and Geography of Human Genes did not engage in "dismantling the idea of race" as a review of Cavali-Sforza book in the NYT claimed, but actually looked like something sketched out by Francis Galton. Marks was mad at Cavalli-Sforza for putting this genetic map on the cover of his book. Productive Dialogue or Dangerous Advocacy? The members of the Anthropology Advisory Committee of the New York Academy of Sciences (NYAS), who wrote a similar letter last year to the New York Times in response to an article by Wade, are equally incensed. While granting that Wade—who has also been a reporter at Nature and Science, but is not himself a scientist—has a right to his opinions, these academics contend that by allowing him to speak at a Leakey-sponsored event, the foundation is legitimizing his views as normative in anthropology. ... In January 2007, when Marks emailed a letter to the foundation questioning their choice of Wade as a speaker, Wade was already scheduled to give two talks. Leakey President Wirthlin did not discuss the letter with anyone at that time; his understanding, he says, is that the staff determines how any potential policy issues should be handled. ... Marks and his colleagues at NYAS remain baffled by the Leakey Foundation’s decision to have Wade speak. “There’s a widespread discomfort with the way he expresses the insights that molecular biologists might have about human behavior,” explains U of Hawai’i geneticist Rebecca Cann. Wade’s critics object to his assertions that certain population-specific characteristics—the supposed violent nature of hunter-gathers such as the Yanomami and superior intelligence of Ashkenazi Jews, for example—may have been shaped over a relatively short period of time (in evolutionary terms) by natural selection and that, in effect, people of different nationalities or “races” may be born with different human natures. His critics allege that among other errors and assumptions, Wade conflates race, ancestry and genetic variation, and that he mistakenly extrapolates from individual traits to group characteristics. So, Edward O. Wilson is for Wade and Jonathan Marks is agin him. Not a bad tradeoff from Wade's perspective. However, many cultural and biological anthropologists warn that, when considered uncritically, Wade’s gene-centric explanations and sweeping generalizations, filtered through what some view as his Western-oriented value judgments, could be used to support eugenics and social Darwinist agendas. “Nobody denies the fact that biology is the basis upon which the potential for human behavior takes place,” acknowledges NYU anthropologist Maria-Luisa Achino-Loeb, who co-wrote a letter in response to Wade’s New York Times reporting with fellow NYAS Anthropology Chair William P Mitchell. Yet Wade’s genetic explanations for population-wide differences in human behavior are anathema to Boasian anthropology. This book is excellent introduction to the thorny topic of human biodiversity. The book's real strength lies in the fact that Marks brings in historical material which illuminates the ideological underpinnings of work on human diversity. Dr. Marks, at the time this book was written was a visiting professor at UC/Berkeley. He had studied anthropology at the University of Arizona and genetics at UC/Davis. According to a note on the copyright page he is known for his work in molecular anthropology. The book's 14 chapters take an extremely broad view of human diversity, both cultural and biological, and of the attempts to understand and explain that diversity. The book covers the history of anthropology's attempts to understand human biodiversity, the evolution of primates, the eugenics movement, a critique of the biological race concept, patterns of human variation - both phenotypic and genotypic, the nature and function of human variation, the role of human variation in health and disease and a critique of hereditarian theory. An appendix discusses DNA structure and function. The chapters are generally well written and referenced. The book is written for an academic audience or at least a reader with a strong foundation in biology. I found the critique of the biological race concept to be the most lucid and well thought out one that I have ever read. Marks points out that a division of humans into three or four primordial races seems to ignore the long history of human intermingling. Either there has always been intermingling among humans - in which case the very concept of biologically separated races is wrong from the start - or intermingling is a more recent phenomenon in which case race may have been relevant in the past but no longer is. Marks points out that the three major races identified in the US - White, Black and Asian - correspond to the three major immigrant groups in US history - from Europe, Western Africa and Eastern Asia. [I note that he did not discuss Native Americans.] There is an excellent discussion of the history of race thinking as it was applied to the ABO blood groups. This makes palpable the argument that within-race diversity is much greater than between-race diversity. Marks devotes a fair amount of time to discussing how cultural values impact on scientific work. This is illustrated by numerous examples, many drawn from a critique of the eugenics movement. 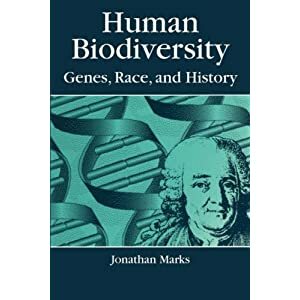 In other words, Marks's Human Biodiversity resembles Stephen Jay Gould's The Mismeasure of Man if only Gould had been much better informed about psychometrics. There's a lot of Gould's Argument from Antiquarianism — Look how these scientists in the days of yore got things wrong, so therefore current scientists have got things wrong, too. That said, I found it extremely helpful to have Marks's intellectually and scientifically sophisticated critique of past theories about race, which helped me reject the Linnaean tradition of thinking about race as a subspecies and formulate a new definition of what a racial group is that is both very useful for understanding better what you see in the news every day and is, logically, very close to being tautologically inevitable: that a racial group is "a partly inbred extended family." As I wrote in VDARE.com in 2002 in "It's All Relative: Putting Race in Its Proper Perspective:"
Obviously, there's something that our lying eyes see. But what exactly is it?Up until the 1960's, physical anthropologists tended to conceive of racial classifications as fitting neatly into a taxonomy of the kind invented by the great 18th Century naturalist Carolus Linnaeaus. The top-down Linnaean system describes how the God of Genesis might have gone about efficiently organizing the Creation. It subdivides living things into genuses and then into species, subspecies, races, and presumably into sub-races and so on. Even "species" is less written-in-stone than it sounds. Witness the constant debate over whether dogs, wolves, and coyotes are three species or one. Enforcement of the Endangered Species Act is constantly being bogged down in disputes over whether a particular brand of bug or weed is a separate species. Billions of dollars of Southern California property development has been hung up for years over whether the rare California gnatcatcher bird is a different species than the abundant Baja gnatcatcher. The only difference is that the California gnatcatcher tends to a somewhat different color than the Baja gnatcatcher. Race is all relative, in two senses. First, it's all about who your relatives are. A modern Darwinian approach to race would start from the bottom up, with the father, mother, and baby. All mammals belong to biological extended families, with a family tree that features all the same kinds of biological relatives as you or I have–grandfathers, nieces, or third cousins and so forth. And everybody belongs to multiple extended families–your mom's, your dad's, etc. That's it–just an "extended family that is somewhat inbred." There's no need to say how big the extended family has to be, or just how inbred. If you go back to 1000 AD, you would theoretically have a trillion ancestors alive at that time–that's how many slots you have in your family tree 40 generations ago. Obviously, your family tree has to be a little bit inbred. That far back, you'd probably find an individual or two from most parts of the world among your ancestors. So, my definition is close to a tautology. But then so is "survival of the fittest." And that proved to have a bit of predictive power. This is a scaleable solution. Do you want to know a lot about a few people? Then, the more inbred, the more distinct the racial group. Or, do you want to know a little about a lot of people? The less inbred, the larger the group. Of course, the bottom-up model accounts for everything seen in top-down approaches. Average hereditary differences are–as one might expect–inherited. The bottom-up approach simply eliminates any compulsion to draw arbitrary lines regarding whether a difference is big enough to be racial. With enough inbreeding, hereditary differences will emerge that will first be recognizable to the geneticist, then to the physical anthropologist, and finally to the average person.